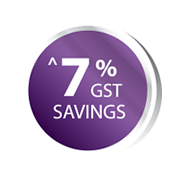 Flying or Not, Save 7% GST^ when you Shop at the Public Areas. Only with the Changi Rewards Card. ^Applicable at participating retail stores located at Changi Airport's public areas. Updated as of 1 July 2016. We give you more reasons to shop at Changi Airport, with your Changi Rewards card! From 1 April 2015, all registered Changi Rewards members enjoy 7% GST savings on purchases at participating retail stores located in Changi Airport's public areas – That’s right, even when you are not flying! Be sure to present your Changi Rewards card at the cashier before payment! + Picked up a free Changi Rewards card? Ensure that you have registered your card, by completing your profile here. # With a minimum nett spend of S$10 in a single receipt, Changi Rewards points are awarded based on the nett amount spent (after deduction of discounts and voucher redemptions) and membership tier. How do I enjoy the 7% GST savings at Changi Airport, even when I’m not flying? With effect from 1 April 2015, shoppers can enjoy 7% GST savings when they shop at Changi Airport's public areas by registering as a Changi Rewards member and presenting your membership card. How do I become a registered Changi Rewards member to enjoy 7% GST savings at participating retail stores in the public areas? Pick up a Free Changi Rewards ‘Take-One’ Card and brochure from the cashier counter at participating retail stores, and register your card at www.changirewards.com/register or at any of the Changi Rewards or designated Changi Recommends counters, to enjoy 7% GST savings. Free Changi Rewards ‘Take-One’ Card and brochure is also available at any Changi Rewards counters and Airport Information Counters. What are the participating retail stores where I can enjoy GST savings as a Changi Rewards member? Please see the list of participating retail stores above. Why must I register my Changi Rewards 'Take-One' Card? How do I register my 'Take-One' Card? Follow the 3 easy steps below, to register your Changi Rewards 'Take-One' card. Complete your profile. Upon successful registration, a confirmation email will be sent. You are now a registered Changi Rewards member, and get to enjoy the full benefits of your membership. I am an existing member, and i am holding/have disposed the old (grey) Changi Rewards card; I am an existing member, and my card is lost/stolen/damaged. Can I pick up a Take-One card from the Customer Service Counters and tenants stores, to use immediately? No, the new cards are strictly for new enrollment only. Members who do not have their Changi Rewards card are required to visit any Changi Rewards counters, for a card replacement. Merging of points earned from 2 different card accounts will not be entertained. I have forgotten to bring my Changi Rewards card, can I use the 'Take-One' card and brochure to accumulate points and enjoy 7% GST savings? No, the 'Take-One' cards are strictly for new enrollments only. Existing members who are unable to present their Changi Rewards card at payment, should not use a ‘Take-One’ Card to earn points for the purchase. I saw the message: 'NRIC you have entered exists - you may have a Changi Rewards account already' appeared when I tried to register the card. What does that mean and what should I do? Looks like the system has detected that you are already a registered Changi Rewards member. Please visit the nearest Changi Rewards counter to collect your card. Changi Rewards members also enjoy year round shopping rebates, exclusive perks & more! Not a Changi Rewards member yet?